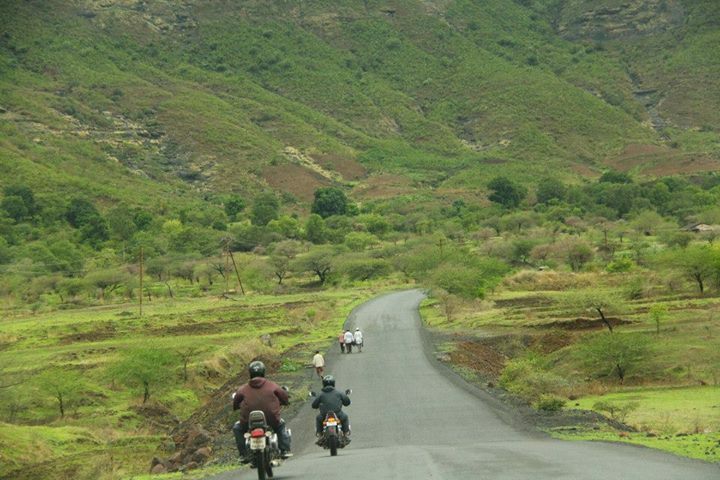 Located nearly 170 kms away from Mumbai, nestled in greens and clouds lies the village of Bhandardara. To reach the place you will need to take the right for Akola if you are going towards Nashik on the Nashik – Mumbai highway and again after the first toll booth you will need to take a right again. At 2500 feet above sea level, Bhandardara is literally heavens as you pass through the clouds and fog; nature displays its beauty in all its grandeur here. I went to Bhandardara on my bike, accompanied by one more friend on his bike and my brother and another friend in his car. Thankfully we missed the main turn towards Bhandardara and instead went all the way round to the other side of the dam. Though the long cut adds nearly 20 kms on your fuel meter its worth it, as you hardly encounter any potholes or problems. The other, actual way has been a victim of government and local apathy and you will struggle to find any roads worth driving on. The bumps generated by the pathetic roads are such that you will be worried if your suspension will exist after you have crossed the entire stretch. Nevertheless the dam and the adjoining areas make up for this apathy. When the water is full, you can actually take a boat ride with the locals till the middle of water body; and trust me, the water is completely edible. I myself had quite a few gulps of the same water on which the boat was floating. Flanked by green hills on all its sides, the area is a panaroma photographer’s delight. Nearby you have the MTDC resort which you serve you the best of the veg and non veg delicacy, and needless to say that their quality is okayish and price is awesome. However, there is one more reason of visiting MTDC and that would be its backyard. The backyard opens up into the lake and you can have a lot many picturesque moments here. Since we only had a couple of hours to spend, this was all that we could wrap up. However, this place is a treasure trove for trekkers and picnickers as it is home to Mt. Kalsubai and Ratangad fort. Also, the Harishchandragarh fort is withing sights from here. Ideally you should leave for this place on Friday evening , check into any of the numerous resorts available, preferrably MTDC and then spend the entire Saturday and check out Sunday evening by 4. You will be able to reach Mumbai within 5 hours at the max. And needless to say, the best times to visit this piece of heaven would be the monsoons. You may check out Wikipedia for more details about here.